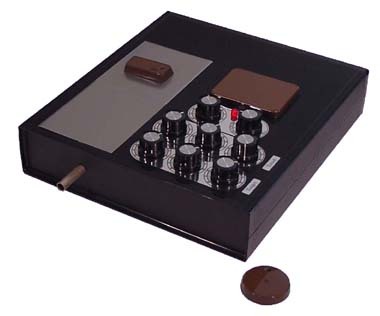 The purpose of a Radionics Device or Radionics Program is to establish structural links. 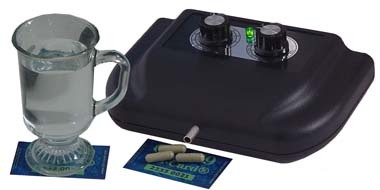 The purpose of a Chi Generator® is the generating of life force, or Chi energy.Therefore, all radionics devices from HSCTI have a built-in Chi Generator® (orgone generator®) to provide the power necessary for effective action at a distance! The ATGS 3000 and RAD 5 are donut-shaped Chi Generators®. Their output pipes point to the center. Their frequency settings are radionics settings. 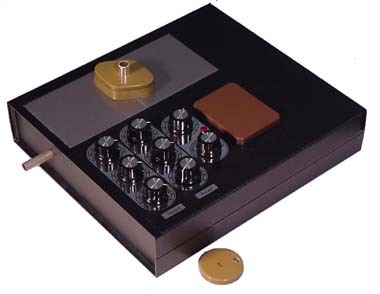 The RAD 2400 HD is a Super Heavy Duty Power Radionics™ Device. It has a built-in powerful heavy duty Chi Generator®, the same as in the LPOG 2400 HD and Performer 2400. It features a stick pad of orgonite®. Use three dials to set the rate for the target, three dials to set the rate for the trend, or desired action. The other two dials set the pulse of the built-in LPOM module (Low Pulse Orgone Module). The RAD 2400 HD to the left has a potency booster on its output pipe. The addition of pulsed life force (orgone, Chi) to radionics makes it a reliable and effective tool to help in your achieving success. The built in Low Pulse Module has 6 low pulse frequencies, plus the option of continuous settings. More about orgone that is pulsed in brain wave frequencies, see the description below. 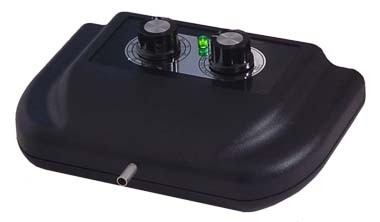 The front panel has input and output jacks for exterior stick pads and exterior wells, These jacks can also serve to connect several Orgon Radionics devices to each other for more power and versatility. The other two jacks: the power jack to the right of the switch, and the “input EPU” jack for an exterior pulse, for instance coming from the EPM – Exterior Precision Module which more than doubles the output – see below. This awesome new technology adds continuous and very powerful life force to your radionic settings for the most rapid success possible! For increased flexibility and at least double the power, you can connect the exterior module (the EPM 2400) to the second orgone generating unit inside the RAD 2400 HD! A built-in Voltage Regulator eliminates the “ripple” from the AC-DC converter and keeps the voltage at a steady 8V DC. Elimination of the “ripple” is ideal when it comes to energizing your body! Power supply: AC-DC converter, 12V, 200mA or higher. Use archaetypal or astrology-based filter cards or the Super Manifestation or Power Radionics Jr porgram to provide any activity you desire with maximum versatility and effectiveness !!! The RAD 2400 HD comes with a free TC 99 Transfer Couple. The PBT 2400 Power Booster with Transfer Disk adds more than 30% of power output. For you to appreciate the special characteristics of the RAD 2400 HD as well as the other devices with low frequency options, it is useful for you to know about low frequency technology. In fact, the most important method of effective self-help prior to the invention of the Chi Generator by Karl Hans Welz resulted from new knowledge of the working of the human brain. It has been well established that every thought, feeling, sensation, and level of awareness has a corresponding brain wave pattern, or frequency. Consequently, you can determine the level of awareness that you want to harness for your success by controlling your brain waves. We know of Alpha, Beta, Theta, and Delta brain waves, all in the low frequency range from approximately 1 Hz to 30 Hz (cycles per second). Gamma frequencies are above 30 Hz. This method of controlling brain waves with low frequency input is not new at all. In the 1930’s researchers found that repetitive light stimulation caused brain waves to adjust to the same frequency. For decades now, some “new age gurus” and other cult leaders made extensive use of repetitive sound pulses, often of the inaudible and subliminal kind. This helps them to cause their captive audiences to be more receptive to their preaching. Much earlier than that, as far back in time as the very dawn of humankind, shamans used drumming (repetitive pulses, or beats, of low frequency) to put their audiences into altered states and to cause them to have experiences that they would not have in their normal state of daily activities. In our times, this type of pulse, or “beat” is used in many events where the capturing of audiences and the temporary control of their habits (or minds) is considered to be important, such as in fashion shows, exercise machine advertising, TV commercials, military training, church meetings, and infomercial pitches to the public, to name just a few. You can find a variety of good Light-Sound (LS) devices on the market today. A LS-device typically stimulates the brain indirectly with light flashes through goggles and sound stimuli (beats) through earphones. These stimuli will cause the brain to adjust to the frequency of the flashes and sounds and consequently generate the corresponding level of awareness. All LS-devices have a serious flaw: They depend on earphones and goggles to be effective. In other words: if you want to access a specific level of awareness such as charismatic appearance, calm, or creativity, you need to get the stimuli through earphones and goggles. It is obvious that you cannot wear these LS-devices in many situations where you really need them! Just imagine appearing on a date, an important business meeting, or a sports event with an LS-contraption on your head! And you cannot do creative writing, or art, either while using a LS-device on your head. You have to take it off your head, and then your brain waves will adjust back to their usual state. That’s exactly where the RAD 2400 HD makes a difference – a big one!!! By now it is well-established that the technology of the Chi Generator® is far superior over the conventional type light-sound mind machines. 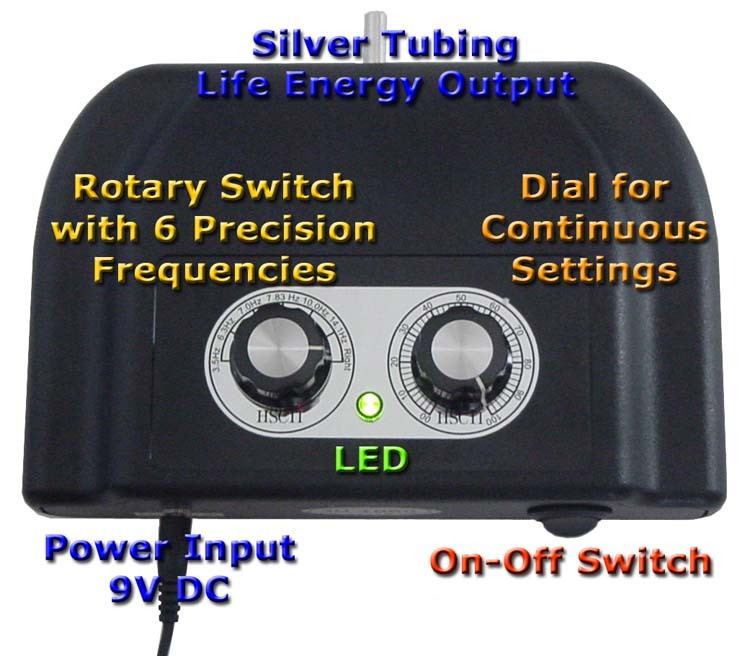 The reasons are obvious: You can set up the Chi Generator® to emit Low Pulse Orgone in the exact frequency of brain waves: Alpha, Beta, Theta, or Delta. When you are in a field of LPO (Low Pulse Orgone, or Chi), your brain can adjust to its frequency instantly. This is so, because the detour over sensory perceptions or questionable electric mini-shocks (as in a couple of more recent devices) is no longer necessary. Life force in brain wave frequencies means a more effective impact and therefore faster results. You can achieve the corresponding states of mind in an instant. The most striking advantage of our LPO technology over conventional type mind machines is the fact that you can project LPO (Low Pulse Orgone) at any distance! Simply use a structural link such as the transfer disk of the RAD 2400 HD or of the PBT 2400 power boosters, put it into your pocket, set your RAD 2400 HD at the desired pulse speed, and go to a business meeting, on a date, to the gym, to a sports competition, or anywhere else. Nobody will notice your invisible helper! That’s all! You can relax or go about your usual business at any place. Use archaetypal or astrology-based filters, the Power Radionics Jr. or Super Manifestation to power up any activity you desire !!! The extensive manual that comes with your RAD 2400 HD will introduce you to the uses above, and then some!